When in Banff, do as the wildlife does. 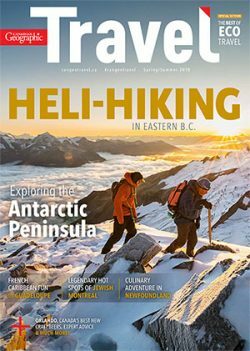 We follow the animal tracks to the best the town and surrounding national park have to offer — from tacos and tea to gnarly ski and après-ski, by way of the woodsiest new sleeping pad around. Ravens decorate the sky above Banff like dots of ink. To see them up close, hike to the summit of Tunnel Mountain, then follow their croaks to the Banff Centre for Arts and Creativity and its Three Ravens Restaurant + Wine Bar. The view alone is something to caw home about. Add the fare, sourced mainly from Alberta farmland (winter squash and beets) and hinterland (roasted elk rack, charred Alberta lake trout) and you’ve got an award-winner. That Banff National Park is cougar country was made especially clear back in January 2018, when a big cat walked through the centre of the Banff townsite. 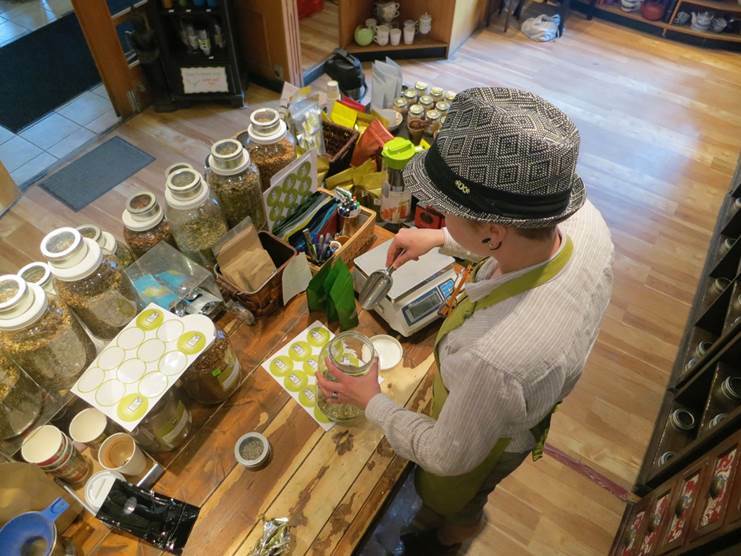 We don’t encourage you seek out the elusive predator; instead get warm and fuzzy with a cup of cougar tea, a herbal concoction with orange and licorice, blended by and sold at the Banff Tea Company. 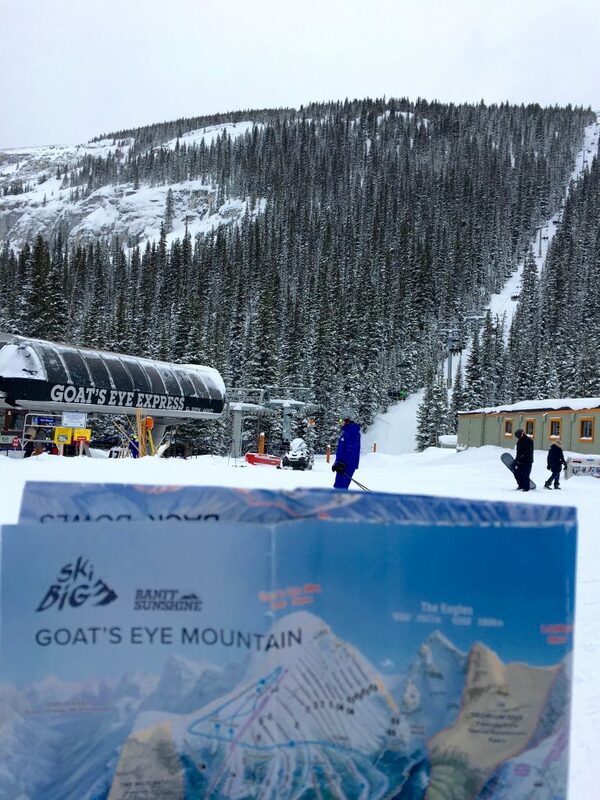 Just try to emulate this agile alpine creature on the slopes of Goat’s Eye Mountain, which offers the gnarliest terrain at Banff Sunshine Village, the ski area on the Continental Divide. Head right when you get off the Goat’s Eye Express chairlift for double-black diamonds that’ll have your hair standing up like the fur of the animal this peak was named for, then chill by cruising down the intermediate-difficulty Sunshine Coast. Hungry like a wolf? 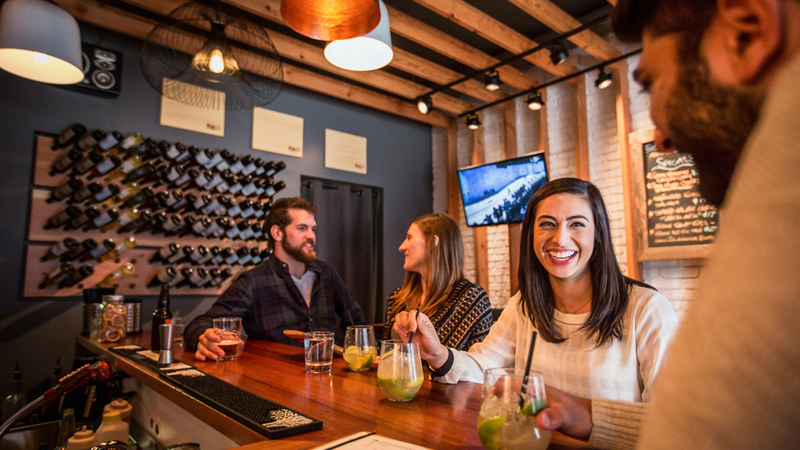 Sniff out the caribou — Caribou Street, that is, home of Block Kitchen + Bar. Located a couple doors down from the Banff Avenue intersection, the small room serves tapas-style sharing plates heaped with nosh like Asian lettuce wraps, red devil calamari and veggie samosas. 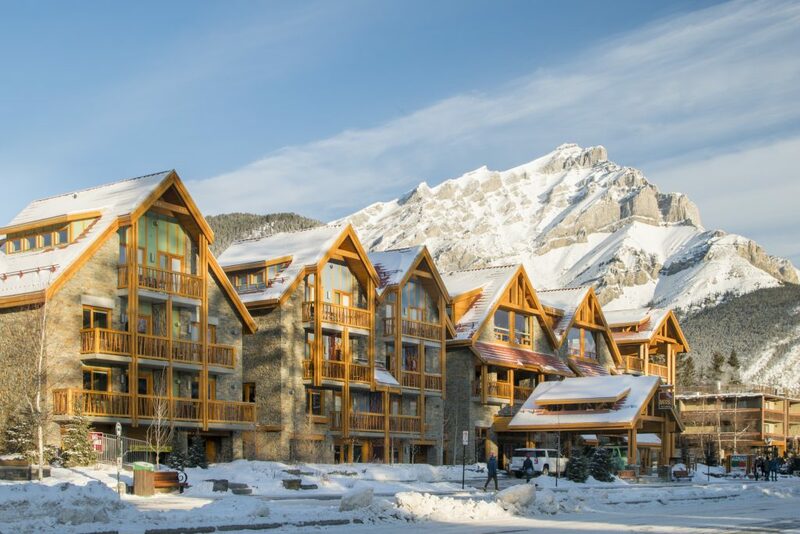 Trace the hoof prints to the Moose Hotel & Suites, one of the newest sleeping pads in Banff. Stepping into the lobby is a bit like entering a forest grove: all around you are wall features, ceiling panels, counters, benches and tables made from at least 10 different types of wood, from reclaimed Douglas fir to Pincher Creek barn boards to a cherry tree salvaged from an urban garden. Each of the 174 rooms features a moose painting by artist Jason Carter. Don’t miss the rooftop hot tub with views of Cascade and Rundle mountains. A member of the corvid family, magpies are famous for picking up shiny objects. Peek into Magpie & Stump and you might think a gang of the black-and-white birds had plucked the town clean of knickknacks — signs, masks, prayer flags, hats and old lanterns — and deposited them in this après-ski joint. 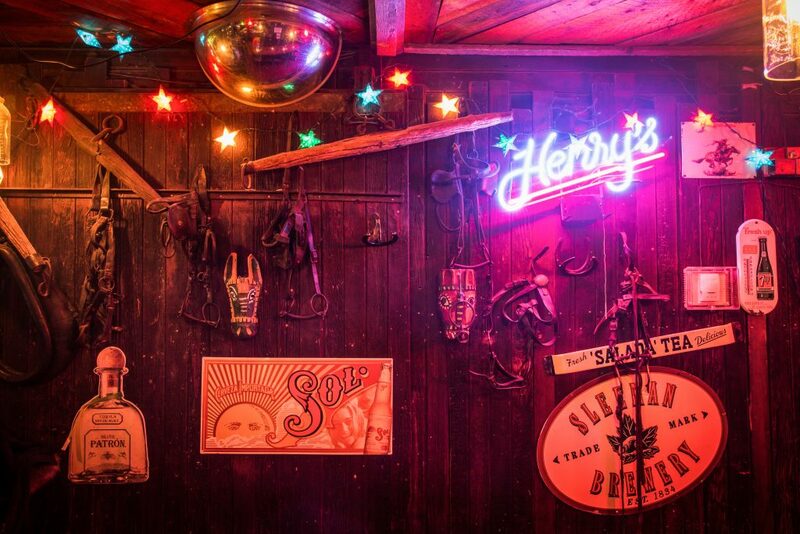 The walls are jammed with paraphernalia — much like the list of taco toppings. Let’s face it: everyone who visits Banff hopes to leave with a wildlife tale or two. The animal you’re most likely to see is the elk, an ungulate with a distinctive white rump and, on the males, majestic racks of antlers. 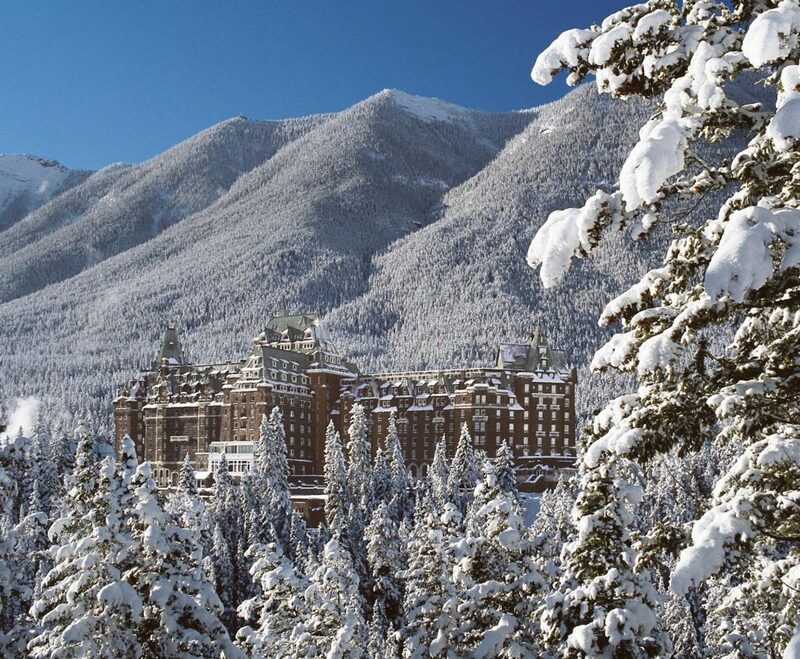 For the best viewing opportunities — and the town’s swankiest accommodations — check in to the Fairmont Banff Springs Hotel, which sits in a wildlife corridor connecting Banff and the Bow Valley. Housed in a 1928 log cabin that has served as a ski lodge, Mad Trapper’s Smokehouse, at the top of the Sunshine Village gondola, now serves lunch to hungry skiers and snowboarders and pints of Alberta beer for après-ski. (It’s also open in summer.) Scan the room and you’ll spot some unusual-looking creatures (mountain men and women notwithstanding), such as the wolf-deer smiling at you from one of the walls. 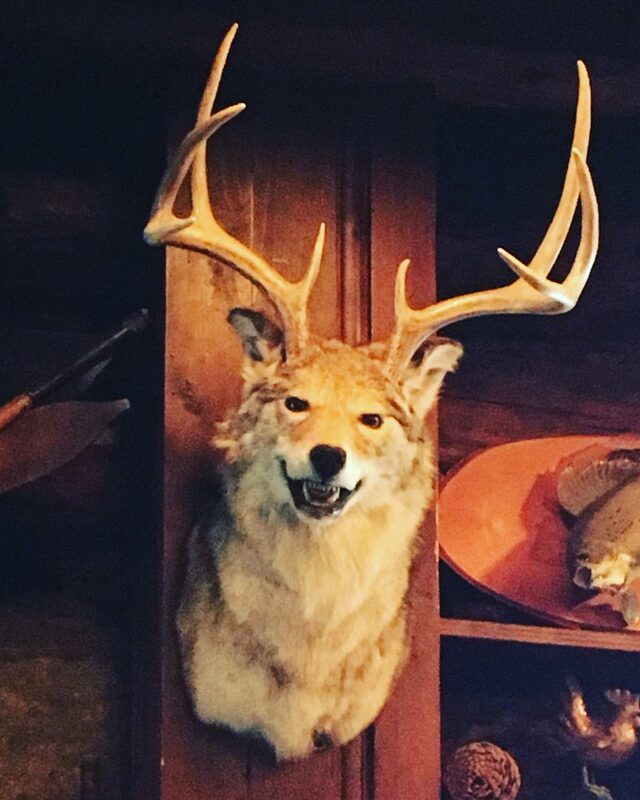 This wolf with deer antlers is a fitting reminder of the mad trapper who lent his name to the saloon. Grizzly bears, some 65 of whom call Banff National Park home, can be seen along forest trails and highways alike. Remember to never, ever feed a bear or leave a single scrap of food behind on a hike. Instead, order some wood fire-roasted snacks at Park Distillery + Restaurant + Bar, and wash it down with The Boss. 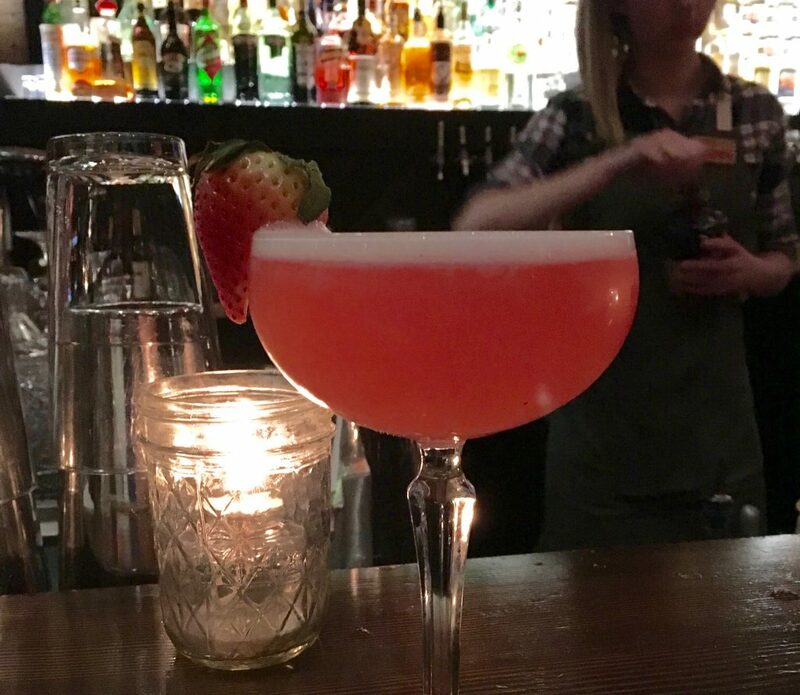 The cocktail, made with Park Vodka (distilled from Alberta grains and Rockies water), Campari, prosecco and grapefruit juice, is a liquid homage to Bear 122, a.k.a. The Boss, a large male who has sired many a cub in the area. 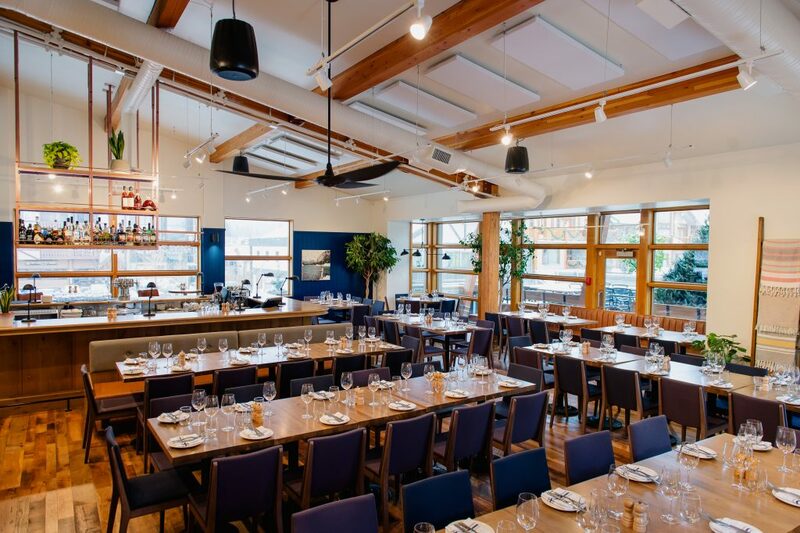 Roughly at the same time as bison were reintroduced to Banff National Park, the Bison Restaurant + Terrace ushered in a fresh décor. The all-white space with warm copper and wood accents artfully plates seasonal and regional ingredients, including — you guessed it — bison (striploin, burger or short ribs). If you’re a grazer rather than a carnivore, no worries: the menu offers plenty of greenery, raw or blistered in the wood-fired oven. Being a magnet for fauna from around the world, Banff has gone to the dogs — including one particular French bulldog. 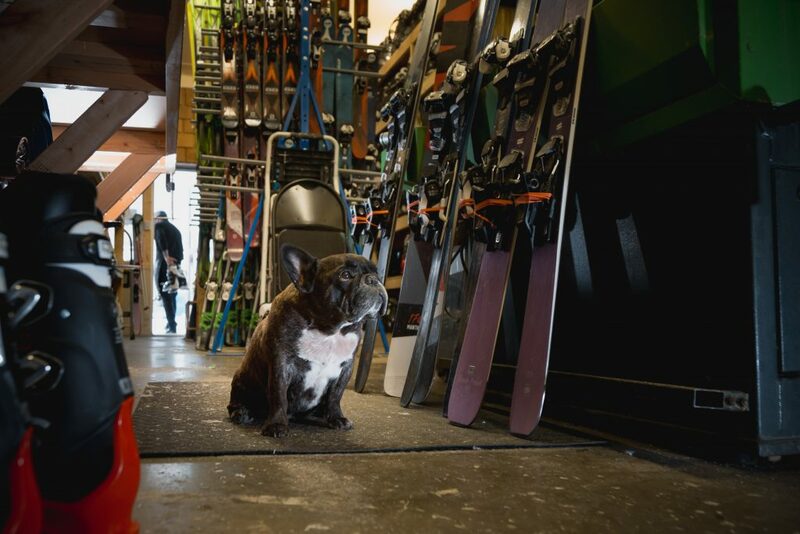 Aristotle, the affable mascot of Black Tie Ski Rentals of Banff, presides over the best ski and snowboard brands on the roster of his owners’ boutique rental business. He may not accompany Black Tie’s knowledgeable staff to your hotel for in-room boot and ski fitting, or tag along when the company picks up your gear after you’re done, but somewhere along the way he’s lent a helping paw. The Arctic muskox, like the French bulldog, is not endemic to the Rockies. But the animal has made inroads in this part of the mountains nonetheless, as Qiviuk. Headquartered in Banff, the company works with Inuvialuit in the Northwest Territories and Yukon to produce garments made of fine muskox wool (the Inuvialuktun word qiviuk means “inner wool of the muskox”). There’s a store on Banff Avenue, and another inside the Fairmont Banff Springs Hotel.